There is no doubt that we live in a digital age where digital communication is the way things seem to be going. If you have been following us on Instagram, you will have seen that this summer we have been travelling a lot, in our families goals we have set travel and experiencing more than just our small part of the UK as a high priority and we want the kids to record this as well. So we’ve started digital journalling with them in the form of travel journals, whether they are journalling a day out, a weekend away or one of our longer vacations they are writing a little something. As a child, teenager and then when I backpacked I kept a travel journal – whether it was in the form of postcards from the various places that we visited, a written account or a sketch book of the trip, with the digital revolution and of course the fact that I blog, use social media and in the UK digital communication in different forms is a part of curriculum from the start of 1st-grade its a perfect time to introduce digital journalling with the kids and travel is a great topic for them to journal about but equally your kids could journal about any topic that is of interest to them. Our Learning objectives are coming direct from the UK government objectives for Key Stage 1 children (year 1 and 2 – 1st and 2nd grade). I believe in giving kids authentic and real experiences so when I decided to start digital journalling with the kids I wanted a way that they would be able to look at easily wherever we were and whenever they wanted so as part of the learning we talked about blogs as a method to record and share information – I explained about Rainy Day Mum being my blog/website and how I communicate different ideas, recipes and information and that I wanted them to share their travel experiences through a micro-blog of their own. You can easily set up a FREE blog through either blogger or wordpress.com. With either site, you choose a name for your digital journal and then work through setting it up like you would like. Detailed tutorials on how to set up a blogger blog can be found here and your wordpress.com blog here. Once you have the blog started make sure you set your privacy for it how you are comfortable with. You will notice that I use J and T instead of the kids full names and because they are featured heavily here on Rainy Day Mum I felt OK with having a public site that they could write on – but both blogger and wordpress.com let you set it up private so that you, family and teachers etc… could have access to it. We set up ours on Travelled So Far – our travel site that I write with my parents, brother and of course, the kids, under the domain I set up a section Journals where the kids and myself are keeping travel journals and sharing with family and friends at the moment only. My kids love taking pictures, they borrow the smartphones, have their own camera and often will help me take pictures with my cameras as well. So whilst we travel they take pictures and I also video and make notes of their thoughts and ideas as we travel. When we have stable internet and access to a keyboard that is a good size for them to use I sit down with them and we start to journal. They each have their own login. With J we first download the images, he knows how to connect up the camera and then help me through the process. 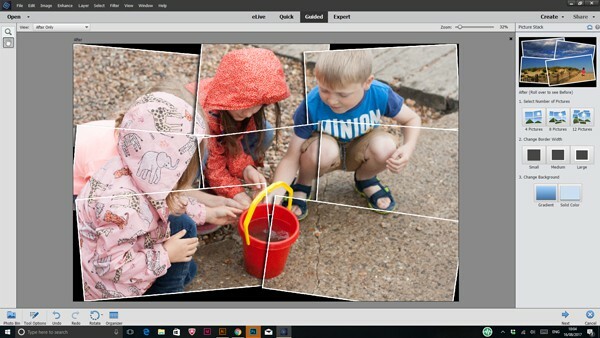 Using Photoshop Elements an easy to use photo editor we can use some of the Guided Edits to create fun additions to the digital journals one of his favourites to use is within the special edits is the picture stack. Once we have the photos he decides which one will best match what he wants to write about and then we upload the images. He will then either sit down and type out his journal entry himself or he will dictate and I will type for him. We’re just about to start adding our journals from this summer as finally are back at home. Maggy from Red Ted Art is also getting her kids digital journalling but instead of using the written word and pictures she’s got them creating video’s and they have set up their own YouTube Channel sharing videos of recipes, crafts, days out and reviews – Red Ted and Pip is where you can discover their digital journalling in action. Check out these other ideas for 2nd-grade students on the topic of journaling this week from the blog team. How neat that your kids have a journal section of your travel blog. I love that they can record their thoughts and activities. Such a memory building experience! This is a brilliant idea to set up a travel blog-journal for kids. I have to give it some thought. I expect some resistance from my husband, since he does not really welcome even my own blogging.